The post What to Feed a Sick Dog by Heather Marcoux appeared first on Dogster. Copying over entire articles infringes on copyright laws. You may not be aware of it, but all of these articles were assigned, contracted and paid for, so they aren’t considered public domain. However, we appreciate that you like the article and would love it if you continued sharing just the first paragraph of an article, then linking out to the rest of the piece on Dogster.com. How can some pumpkin help dogs? Photography ©Tuff Photo by Victoria Rak. According to Dr. Regis, when it comes to what to feed a sick dog, pure pumpkin (not pumpkin pie mix) often “does what you need it to do.” If you’ve got a dog with diarrhea it can firm up the stool, but when served to a pet who is constipated, it’s going to loosen up the stool. A woman feeding a dog a mushroom. Photography ©elenaleonova | Getty Images. In those extra-gross diarrhea cases where pumpkin isn’t a good fit, Dr. Regis often reaches for foods that are more energetically cooling from a Chinese medicine perspective, like mushrooms. “Mushroom is one that I use a lot for some diarrhea cases because it’s very good at drying water from the GI tract and helping to solidify it and get it out of the body,” she explains. While pet parents can talk to their vet about different kinds of mushrooms, in general, if you’re just looking to support water balance in the body, the usual offerings in your local supermarket produce section will do when it comes to what to feed a sick dog, Dr. Regis says. When giving your dog mushrooms: Never feed mushrooms from your yard or the woods, as some mushrooms are very toxic. Safe mushrooms are found in your grocery store and include white, portobello, shiitake and cremini. Serve these mushrooms plain without the fancy sauces we humans add. Only a piece or two at first to make sure there is no food sensitivity and then feed in moderation. Use medicinal mushrooms like reishi, turkey tail and lion’s mane under the guidance of your holisitic veterinarian. 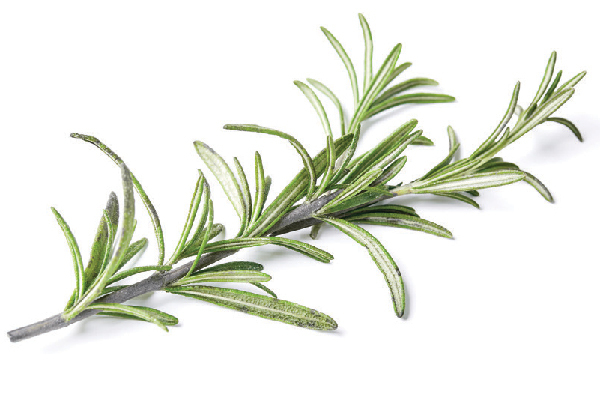 Rosemary is among the beneficial herbs for dogs. Photography © Azure-Dragon | Getty Images. We may think of herb gardens as being just for us, but Dr. Regis suggests that a sprinkling of herbs can be a great choice for what to feed a sick dog, too. “If you have your dog on kibble and you want to add a little bit of a nutrient boost, a lot of your different culinary herbs have different effects depending on what you want to treat,” Dr. Regis explains. Dr. Regis’ favorite herbs include parsley (good for itchy dogs with skin issues), mint (good for calming heartburn or ulcers) and rosemary (an anti-inflammatory herb that can be helpful in treating arthritis). 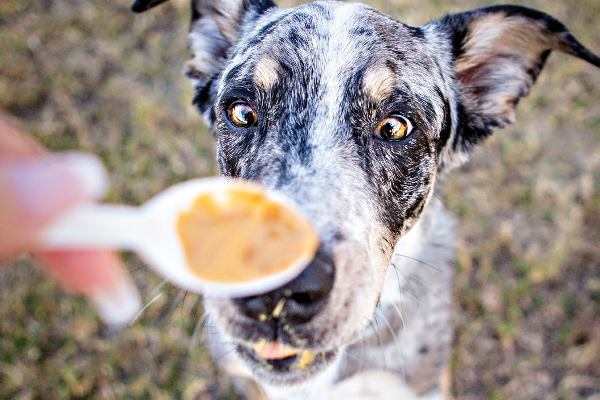 Tumeric has its health benefits for dogs. Photography ©Boonchuay1970 | Getty Images. According to Dr. Regis, turmeric is another powerful anti-inflammatory and can be a great option for what to feed a sick dog who is achy and stiff. However, she cautions that this healing food is only appropriate for dogs who do not have digestive issues going on as well. 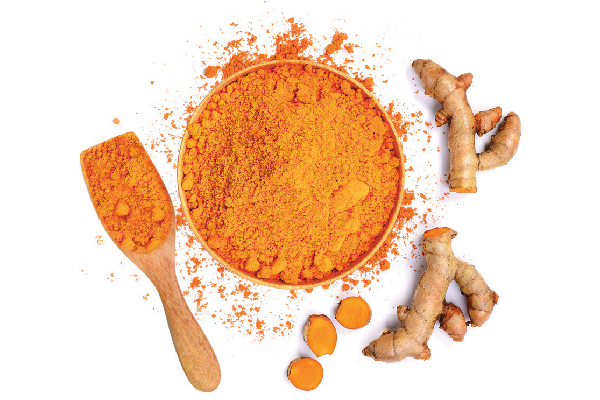 “If they also have, say, irritable bowel syndrome and are prone to a lot of inflammation in the gut, they may not be able to tolerate the turmeric quite as well as a dog that has a healthy GI tract,” she explains. 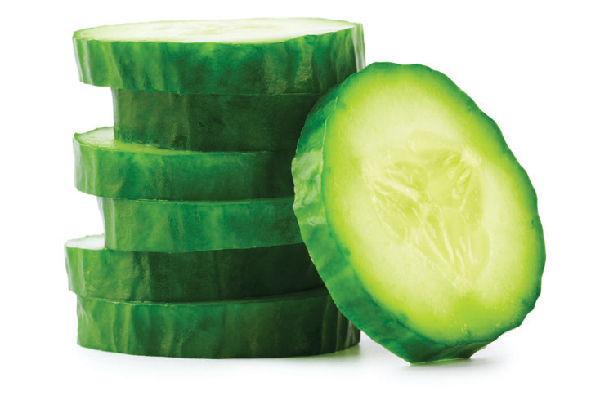 Cucumbers are a healthy, hydrating snack for dogs. Photography ©Leks_Laputin | Getty Images. Unlike turmeric, cucumber is less likely to upset a pup’s tummy and can be used to help in cases of stomach upset, even in some cases where pumpkin isn’t a good fit. Cucumbers are mostly water, so they’re hydrating and can make a good snack for what to feed a sick dog who’s at risk for dehydration. According to Dr. Regis, dog owners should know that they don’t have to start cooking meals from scratch in order to add some holistic healing power to a dog’s daily dish. Also, know that a holistic vet can help prescribe healing foods that the humans of the house have time to prepare. 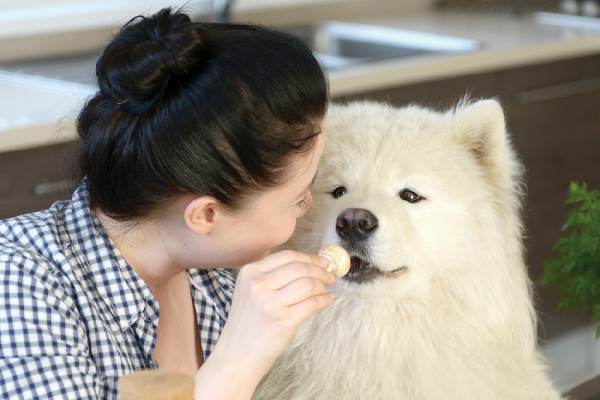 “Even if you change just 30 percent of their current diet, that’s going to have a profound impact on the dog’s overall health,” she explains. 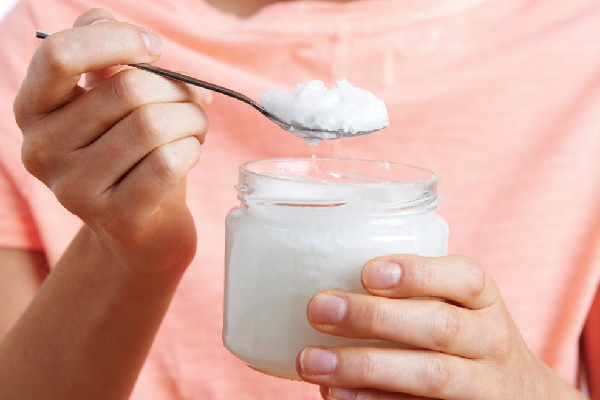 Coconut oil has quite a few beneficial uses for dogs. Photography ©Highwaystarz | Getty Images. This antifungal oil is used by many dog lovers to treat skin conditions by adding oils or fats to the diet. Despite its internet reputation as a “cure for everything,” there are times when another fat may be more appropriate, so check with your vet before buying the jumbo-sized jar. Oregano oil is good for dogs. Photography ©vikif | Getty Images. This oil is a little harder to find than coconut oil but should always be diluted with coconut oil or another oil if you choose to use it. 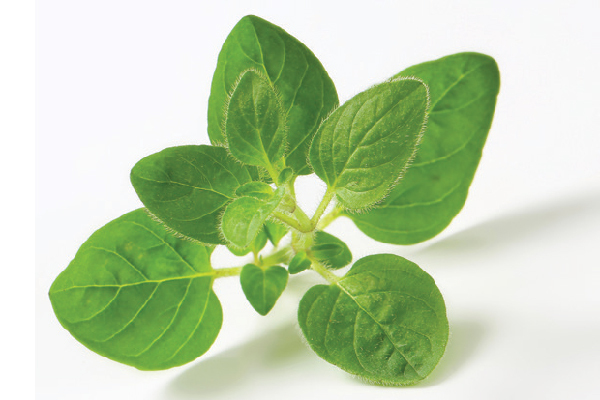 Oregano oil is commonly used to treat skin conditions and infections. Thumbnail: Photography ©Zbynek Pospisil | Getty Images. Heather Marcoux is a freelance writer whose dogs, GhostBuster and Marshmallow, would gladly have a second helping of anything on this list. @HeatherMarcoux is on Twitter, and her stinky dogs are on Instagram as the @ghostpets.